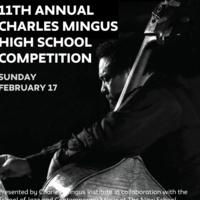 Produced by Sue Mingus and The Charles Mingus Institute, and Dr. Keller Coker of The New School's School of Jazz and Contemporary Music, the 11th Annual Charles Mingus High School Competition takes place February 16 and 17. The nationwide competition showcases young jazz talent from high schools across the country. Presented by Charles Mingus Institute in collaboration with the School of Jazz and Contemporary Music at The New School.